A visit to the Kumbh Mela is a sensory experience like no other and is an absolutely must do at least once in a lifetime. “Kumbh Mele Mein Bichadgaye’ that loosely translates to ‘getting lost in the Kumbh mela’ is a metaphor that we have all grown up with thanks to Bollywood’s most used cliché. 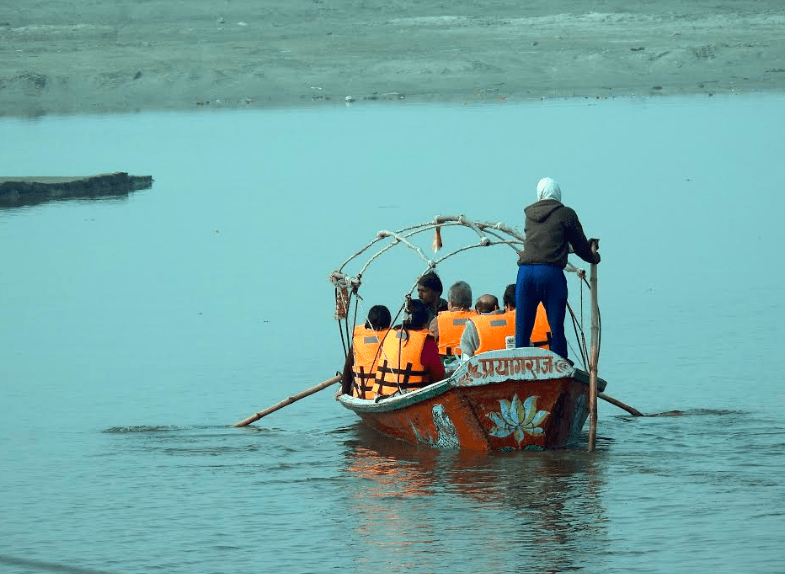 A visit to the Uttar Pradesh Kumbh Conclave 2019 by the UP Government however will bust several myths and open your eyes to a world that is novel, colourful, spiritual, commercial and crowded. Said to me a prominent spiritual center, Prayagraj, the new name for the city of Allahabad has been described in scriptures as the holiest pilgrimage centers in India. Perhaps the fact that it is situated on the Triveni or Holy Sangam where the rivers Ganga, Yamuna and Saraswati meet that gives it this tag. This also makes it the venue of sacred fairs and the Kumbh Mela is arguably among the biggest of them all. Legend has it when the Gods and Demons were churning the ocean for nectar and it was being taken back four drops spilled at Prayagraj, Ujjain, Nashik and Haridwar, which are now the venues of the Kumbh Mela. 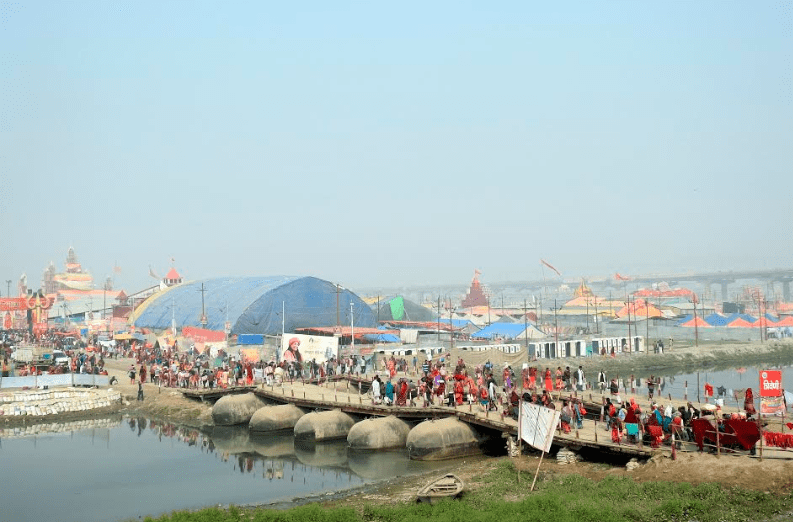 While the Kumbh Mela happens once in six years, the Magh Mela happens annually in the Jan-Feb period and the Mahakumbh Mela happens once in 12 years. 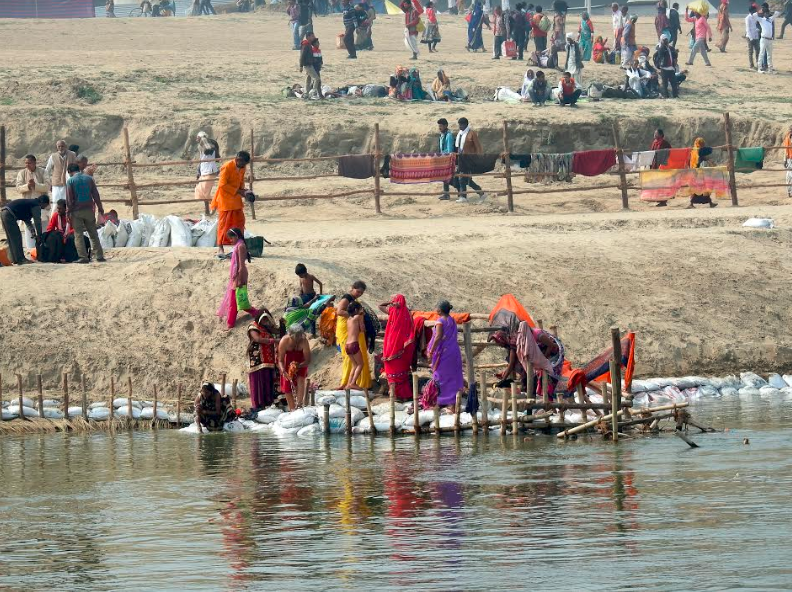 Taking the ceremonial dip in the river during this time period – the mela is on from 15th January to 4th March 2019 is said to help people break free from the cycle of birth and death and attain liberation. This is one of the main reasons you will see people from all faiths come together to take a dip in the sangam area. One of the most common colours you will see at the Kumbh is saffron courtesy the large congregation of sadhus and godmen who throng the mela. This also means you have several photo opportunities as well as personal stories to enthrall you. Most people are willing to talk and you will come away with some most inspiring stories. Take for instance the case of octogenarian Pritam Singh, from Baitul in Madhya Pradesh who at 86 walked 10 km to reach the Kumbh site, his fifth incidentally and credits that he and his family feel fortunate that they are able to visit the Kumbh. If you are here, a must visit is the evening Aarti that happens on the banks of the Sangam that is magically beautiful against the setting sun creating a stunning visual that remains with you much after you have left the place. 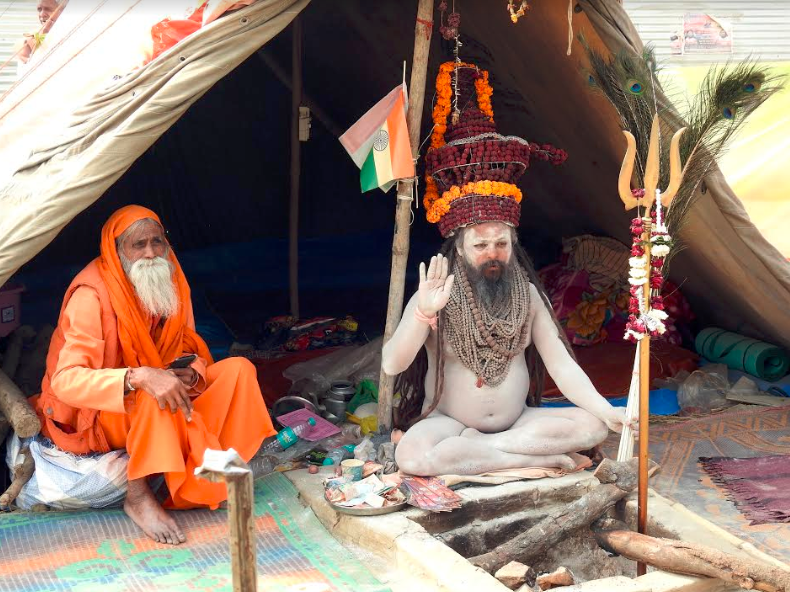 One of the key highlights of the Kumbh is the presence of the elusive Naga Sadhus said to be the preservers of faith who throng the mela in large numbers. In fact on the important days it is them who take the dip called Maha Snaan first before others do. Having renounced everything, these Sadhus are naked and cover themselves with ash and rudrakash beads. However if you are taking a picture make sure you first take their permission as many of them expect a tip in return! A massive tent city has been built on the banks of the sangam that offers a range of tented accommodation for people to take part in the mela. Being on the banks of the river, you can enjoy a beautiful sunrise (be prepared to brave the cold) from here and see some amazing birds too. The mela is amazing clean and this has been courtesy the 1.2 lakh plus toilets and efficient garbage management systems in place. To ensure that the river is clean there are people stationed at the banks to remove anything that is tossed inside and this has ensured that this Kumbh Mela is a green one. Ashish Goel, Divisional Commissioner, Prayagraj in fact has said that the state will attempt three world records at Kumbh in the areas of sanitation, transportation and paint my city, a street art initiative that has seen 22 million square feet of walls painted across the city. There are a variety of experiences that ensure there is something for everyone irrespective of age. Explore the creative center Kalagram that has 13 pavilions and 7 cultural centres that exhibit state specific craft. There are also several cultural events that are happening include performances by folk and tribal artists. There are also 25 temporary thematic gates marking the approach roads to the Mela Area that have been done using sustainable materials. The mela has also gone tech savvy this year and you can experience a 360 degree virtual reality experience of Kumbh 2019 set up in main locations that will allow you to see the all the action virtually. So what are you waiting for? Chalo Kumbh Chale. Accommodation: A variety of tented accommodation is available at Tent City including Kumbh Village, Kanj Kiri, Kalpa Vriksh, Kumbh Canvas, Vedic Tent City, Indraprastham City and Aagman India. Each of the tents has several variants and prices vary based on the kind of tent chosen and is available across a range of price points. 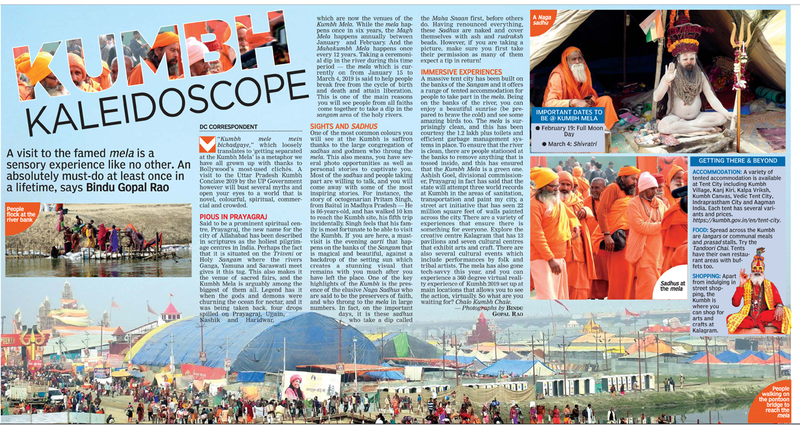 More details at https://kumbh.gov.in/en/tent-city. Food: Spread across the Kumbh, are langars or communal meals and prasad as well as way side stalls that sell everything local. Try the Tandoori Chai a specialty of the region. Tents have their own restaurant areas where buffet meals are served. Do visit some of the well-known eateries of Prayagraj like Dehati Rasgullah, Netram Kachaudi, Hari Ram Sweets & Namkeen Chowk and Pandit Chat Bhandar to sample local specials. Shopping: Apart from indulging in street shopping for small Knick knacks, the Kumbh is where you can shop for arts and crafts at Kalagram that has 15 shops in each pavilion including a range of products handcrafted by the artisans from across the country. Next Next post: How to have good spinal health?